You might have already heard or seen a new team member but we’re going to officially introduce him! 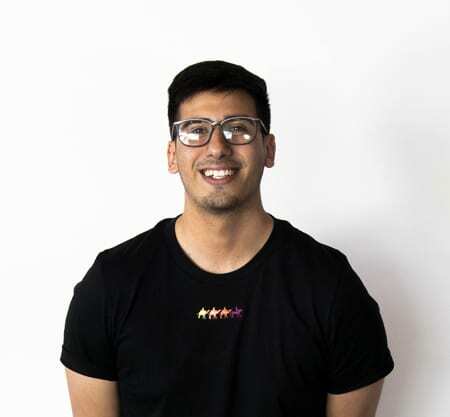 Cristian Pacheco has been an awesome addition to our team as a Graphic Designer and Photographer. Here are some questions to get to know him better. I designed for a publishing house that licensed and printed theatre plays. I am one of the designers and photographer at LAM. It’s a creative space that allows you to be yourself and it’s an agency that is always thinking forward. My first thought every day is “what am I making today?” it’s easy to get motivated every morning when you know you get to create or design something new each day. I own a clothing brand outside of work so most of my free time is spent designing new collections, planning shows, and all the other fun stuff that comes with the fashion world. The only time I’ve ever been arrested was for sneaking my way up to a rooftop of a tall building to get the perfect photograph of a bridge. My friend was in handcuffs while I got the opportunity to show the cop the pictures I took. Luckily the owner of the building accepted my apology and no charges were pressed, both the cops and the owner liked the pictures but thought I was weird.